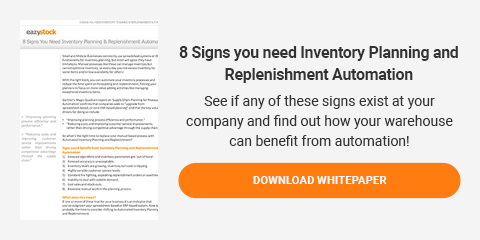 For companies that need to manage a large number of stock keeping units (SKUs), one of the most effective ways of making product replenishment more accurate and efficient is to use an automated inventory procurement system. When thousands, or even millions, of different products need to be managed, manual ordering inevitably consumes a lot of time and resources, affecting the overall business performance. Inventory procurement and purchasing managers are often times left having to guess what inventory needs to be replenished, which piles on additional carrying costs. Guess work procurement processes increase the risk of the business carrying too much inventory (excess stock) or too little inventory (stock outs) to meet customer demand. An automated inventory procurement system never stops working and is considered a perpetual inventory system. It constantly monitors stock levels, sales data and demand patterns across all inventory items in all warehouse or distribution centers. With automation common issues such as human based procurement errors, inaccurately calculated parameters or forgetting orders, are eliminated. A good replenishment system factors in forecasted changes in demand, including seasonality trend, and adjusts the replenishment orders with accurate economic order quantities and reordering points. It increases service levels, leads to increased sales and improves customer satisfaction. Well-configured replenishment systems classify products individually and assign them different attributes based on the velocity of the items unique demand pattern and inventory turnover. This allows service level targets to be set higher for the products that customers consider most important and purchase most frequently. Using an inventory control system that recognizes sales frequency, profit margin, or sales value allows a company to manage its inventory in a way that best ensures long term profitability. A competent procurement system is able to calculate the safety stock level for each SKU separately and will set the safety stock levels so that the service level target is met as efficiently as possible. It takes the predictability of demand, delivery lead-time, and delivery accuracy of each item into account. The greater degree of accuracy in inventory management offered by a good replenishment system makes it possible to increase service levels and inventory turnover, simultaneously. A good procurement system will make the replenishment process more cost effective, as well. Automating stock level monitoring and routine replenishment orders saves a huge amount of inventory planning and ordering time. Inventory planners and purchasers can be reassigned more challenging tasks such as assortment planning, supplier negotiations, sales support, and exception management. Exception management can also be managed in the system. The system is able to anticipate product shortages, late deliveries, seasonal products where there is a risk of excess stock and other exceptions, faster than any manual process. The system should respond to the exceptions automatically, and flag what is important to the user. The system should be able to be configured to fit your business. Implementation time should be quick and easy, preferably less than six weeks. Demand Forecasting: The system must support automatic demand forecasting at the SKU level and be able to take into account periodic or seasonal variations as well as trends and changes in demand automatically. Safety Stock Management: The system must be able to calculate efficient safety stock levels at the SKU level, taking into account the predictability of demand, delivery lead times, and delivery accuracy. Automated Ordering & Optimization: Cost-based optimization of order quantities and order intervals at the supplier or product level. How much are your legacy applications costing you?